The following post is a guest article by Alex Taylor. Alex is a British student about to embark on his history degree. He is particularly fascinated by medieval and early modern English history. In this post, Alex explores the culture of the Elizabethan period, a mesmerising and enigmatic time which saw the flourishing of theatre, the growth of outlandish fashion, and the introduction of new foods into England. Over to Alex! When we think of the Elizabethan period the initial image we draw up is that of Queen Elizabeth I, the daughter of King Henry VIII, the notorious Tudor king who beheaded two of his six wives. This period inspired a sense of national pride through international expansion and events such as the naval triumph of the Spanish Armada in 1588, which saw England defeat the hated Catholic Spaniards. Historians have often depicted this era as the golden age in England's history, with famous historian John Guy citing the era as 'economically healthier, more expansive, and more optimistic under the Tudors than at any time in a thousand years'. This fascinating period represented the culmination of the English Renaissance and saw the beginnings of theatre, poetry and music. Some of England's most famous playwrights originate from this exciting and prosperous period, most notably the renowned William Shakespeare and the young Christopher Marlowe, whose works are still performed and studied almost 5 centuries later. 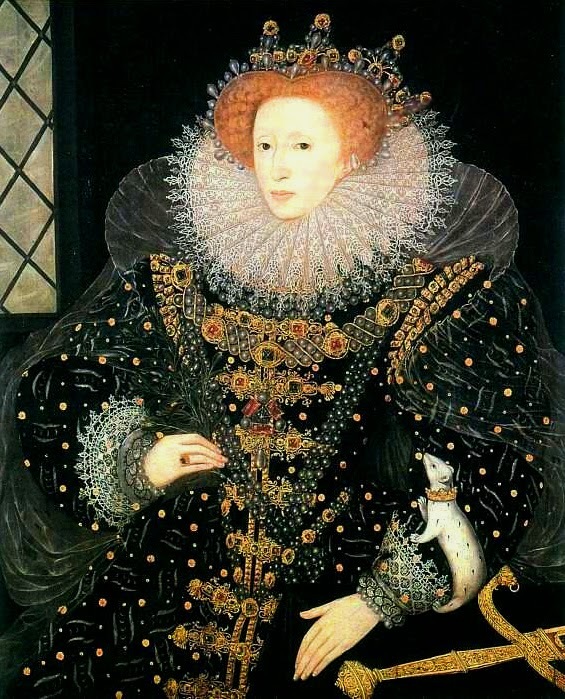 Fashion played a distinctive part in Elizabethan culture. It was a highly fashion conscious age with the royal family and wealthy nobles spending vast amounts of money to keep up with the current trends. Both noblemen and women were indeed expected to be keeping up with the most fashionable clothing of the era, no matter how elaborate or striking they may have been. 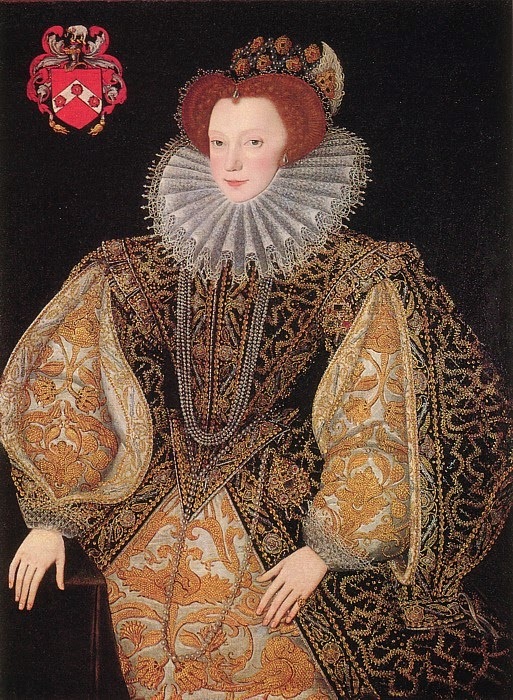 In fact, the Elizabethans were keen to stand out, displaying some extremely ostentatious and garish arrays of clothing, including large ruffs (pleated neckpieces) and farthingales which gave the wearer an exaggerated, bell shaped skirt. A high status Elizabethan would often display their wealth through their clothing, by wearing heavily jewelled clothes encrusted with precious stones which included pearls, rubies and emeralds. These would be embroidered onto equally luxurious and fine materials such as velvets, silks, and damask. Women's hairstyles were also starting to come into fashion. The Elizabethan period saw the court ladies start to reveal more of their hair with eccentric, brushed back hair adorned with jewelled headpieces. They also indulged in new practices such as hair dying by mixing cumin seeds, saffron and olive oil. This can be related to Elizabethan make-up. High class ladies, especially ones within the royal court, would apply sulphur and lead based products to their face for a clear, pale complexion which was, in Elizabethan culture, highly desirable, Queen Elizabeth herself being an avant user of these popular products. This method was highly dangerous as lead and sulphur are both poisonous and can lead to extreme skin irritation and even death. Kohl was also used to darken eyebrows which would be plucked thinly, along with the hairline, as a large forehead was seen as attractive by the standards of the day. Fashion could also be used to display a message, for example, with the execution of Mary Queen of Scots. On her execution day, Mary wore the colour red, and died in the colour of her faith, Catholicism. As a Protestant nation, this was antithetical to England's beliefs; however, Mary was determined to die in the faith she so strongly believed in. Many wealthy individuals, including the queen herself, had an array of portraits painted of them. Only the very rich could afford to be painted. The nobles would wear their finest clothes for their portrait and would hang them in their noble houses to show their wealth. Guests and visitors to these grand establishments would be greeted by portraits of the owners displaying their extravagant clothing, which displayed their wealth and high status. Nicholas Hilliard was a popular miniature artist during the Elizabethan period and painted for a number of high profile individuals, including the queen and her successor James I of England. These miniatures were incredibly intricate with a high attention to detail and were extremely popular during this period. They could be given as gifts and even as love tokens. displaying a large, pleated Ruff. The English Renaissance theatre flourished during the reign of Elizabeth I and the culture of theatre grew incredibly popular with both the higher classes and the working people. It offered Elizabethans from a variety of different classes entertainment and became a definitive part of Elizabethan culture. Theatrical life was largely centred in London, being the capital of England and the most cosmopolitan city in the country. The first permanent theatre, 'The Red Lion' was open to the public in 1567, however, it soon closed down. More successful theatres, such as 'The Theatre' opened in 1576 and became popular with the citizens of London. The Theatre includes a number of importance acting troupes including 'The Lord Chamberlain Men' who employed Shakespeare as actor and playwright. Costumes were often coloured vividly so they would be attractive for the audience; they were also reused and recycled numerous times as they could be expensive to buy and re-dye. Queen Elizabeth herself did not visit any public theatres, as that would not befit her queenly status and dignity, however, Shakespeare was ardently attracted to his royal mistress and her court and proved a faithful servant, performing numerous times for her at court events within his career. It is known from the state papers that the company to which Shakespeare belonged to, in the Christmas holidays of 1598-99, played before Her Majesty at Whitehall and Richmond Palace. They also played again before Her Majesty at the latter palace on two occasions in 1600. The English Renaissance theatre continued to be popular and a large part of cultural society even after the Elizabethan period, into the reign of King James I of England and King Charles I. Its popularity began to decline during the English Civil War when it was associated with royalism and with the rise of Puritanism that saw it as highly sinful and offensive to God. The culture of this period cannot solely be attributed to just fashion and theatre, but to a large variety of different aspects including food, with new foods being introduced such as potatoes, which were popular among the higher classes until they fell out of popularity. Sugar also became a staple diet in noble families. It was even used to clean one's teeth! Sir Walter Raleigh was famous for bringing tobacco to England, popularising smoking which has continued to be consumed into the twenty-first century. During the Elizabethan period, inhaling tobacco was initially used for medicinal purposes and gradually over the centuries became addictive. It was a lifestyle choice, rather than being chosen for its health benefits, of which there are none. Overall, the Elizabethan period has provided history with a rich and colourful culture, a culture that encompassed unique clothing, the origins of theatre and the expansion of the English Renaissance movement, exploring the new world, a sense of national pride, and a long prosperous reign under the virgin queen, Elizabeth. In your research did you come across any reference of Shakespeare living in Windsor and later performing the "The Merry Wives of Windsor" before Elizabeth I in the Vicars Hall, St George's Chapel, Windsor Castle? It is a local tale. So much has been written about Henry VIII and Queen Elizabeth. Why does no one do serious research of the much under-rated reign of King Henry VII, building on the recent work by Thomas Penn, Chris Skidmore, and Dr. Steven Gunn? I completely agree Matthew. Henry VII's reign is seriously under-explored; hopefully future scholars will devote time and effort to studying it and offering new perspectives on his rule. It would also be great to learn more about the lives of ordinary Tudor people; however the scarcity of sources for the general populace means that this would be a very difficult undertaking.